Last analysis of Silver expected more downwards movement which is exactly what has happened. The target was 21.158. 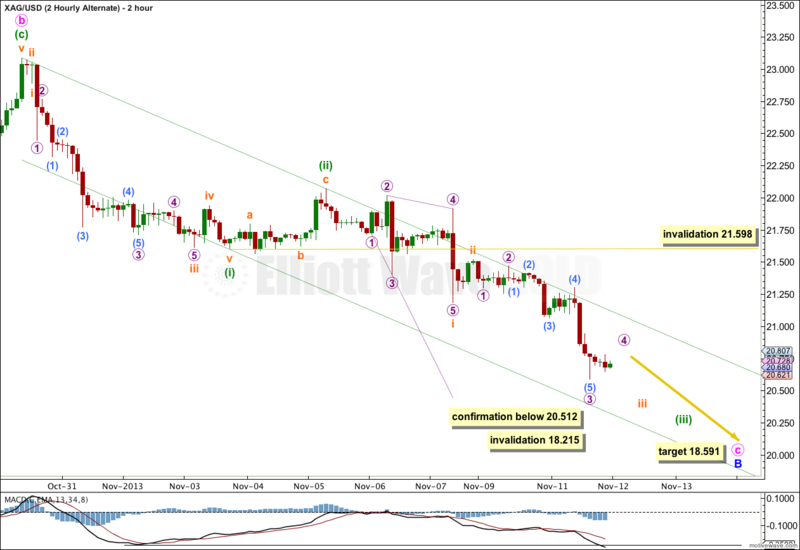 So far price has reached down to 20.588, 0.57 below the target. I have a new alternate for you this week. I have continued looking and finally have found an alternate which has a reasonable probability. Intermediate wave (B) is unfolding as a simple zigzag. Minor wave A subdivides as a five, and minor wave B is now a complete “three” (a double zigzag). At 27.417 minor wave C would reach equality in length with minor wave A. Minor wave A lasted 43 days, and minor wave B lasted a Fibonacci 34 days. I would expect minor wave C to last between 34 and 43 days, or thereabouts. The parallel channel drawn here is Elliott’s technique for a correction. Draw the first trend line from the start of minor wave A to the end of minor wave B, then place a parallel copy upon the end of minor wave A. I will expect minor wave C to find resistance at the upper edge of this channel, and it is most likely to end there. 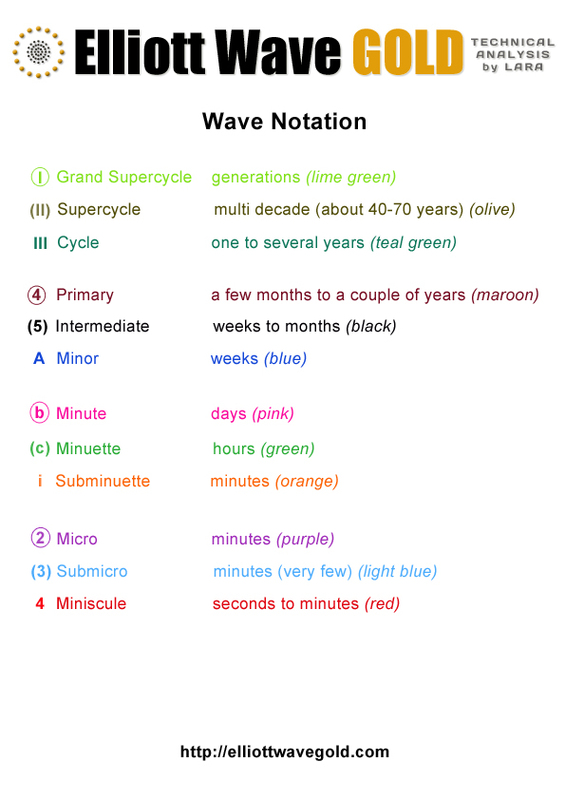 Within minor wave C minute wave ii may not move beyond the start of minute wave i. This wave count is invalidated with movement below 20.512. The key to this wave count and the reason why I judge it to have a higher probability is the triangle labeled minuette wave (b). This structure looks so typically like a contracting triangle. It subdivides nicely into a series of zigzags, with the b wave longer lasting and having deeper retracements on the five minute chart. If this structure is a triangle then it is either a B wave or a fourth wave. It cannot fit as a fourth wave so it may be a B wave. 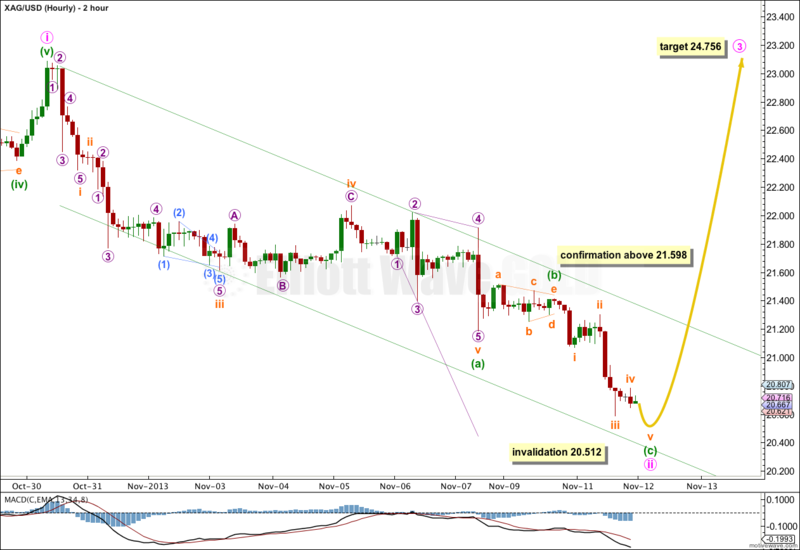 Within minute wave ii zigzag minuette waves (a) and (b) may be complete. Minuette wave (c) may be very close to completion, only the last fifth wave downwards needs to complete. If price moves above 21.598 in the next few days then I would have confidence in this wave count. At that stage I would expect overall upwards movement for about another 23 days from today’s date. At 24.756 minute wave iii would reach 1.618 the length of minute wave i. Minute wave ii may not move beyond the start of minute wave i. This wave count is invalidated with movement below 20.512. My first alternate included a rare running flat. I discarded it due to a low probability. This idea has a better fit. It is possible that minor wave B is an incomplete zigzag. Within minor wave B minute wave a subdivides nicely as a leading expanding diagonal. Within the leading diagonal all the subwaves are zigzags except the third wave which is an impulse. For this piece of movement this structure has the best fit. Minute wave b is labeled as an expanded flat correction. Within it minuette waves (a) and (b) both subdivide as three wave zigzags, and minuette wave (b) is a 106% correction of minuette wave (a). There is no Fibonacci ratio between minuette waves (a) and (c). Minuette wave (c) is an incomplete impulse. At 18.591 minute wave c would reach equality in length with minute wave a. If this wave count is confirmed with movement below 20.512 then I would add to the target calculation for minute wave c when there is enough structure within it to use minuette wave degree, so this target may change or widen to a small zone. Minor wave B may not move beyond the start of minor wave A. This wave count is invalidated with movement below 18.215. Although this wave count has a very good fit on the daily chart it does not have as nice a fit on the 2 hourly or five minute charts. This wave count cannot see a triangle where the main wave count sees it’s minuette wave (b). This alternate must see this piece of movement as a series of overlapping first and second waves. Although this is very common it seems to be a stretch, and it seems to be ignoring what looks like an obvious triangle. However, on the five minute chart it does fit, although there is at least a running flat in there for a second wave. For this alternate there is so far a slight increase in downwards momentum for the possible third wave of this impulse. This does fit, but the increase is not convincing. If downwards momentum increases further in momentum then this wave count would increase in probability. Within this alternate wave count there are three more fourth wave corrections which should unfold during the next few days or so. The last of them, minuette wave (iv), may not move into minuette wave (i) price territory. This alternate wave count is invalidated with movement above 21.598. Since Silver invalidated today at 20.51, silver and gold can simply invalidate the alternative at 21.598 . Then I guess the main count is still valid? If silver moves above 21.598 then the alternate (now the only wave count with the main already invalidated) would be also invalid. 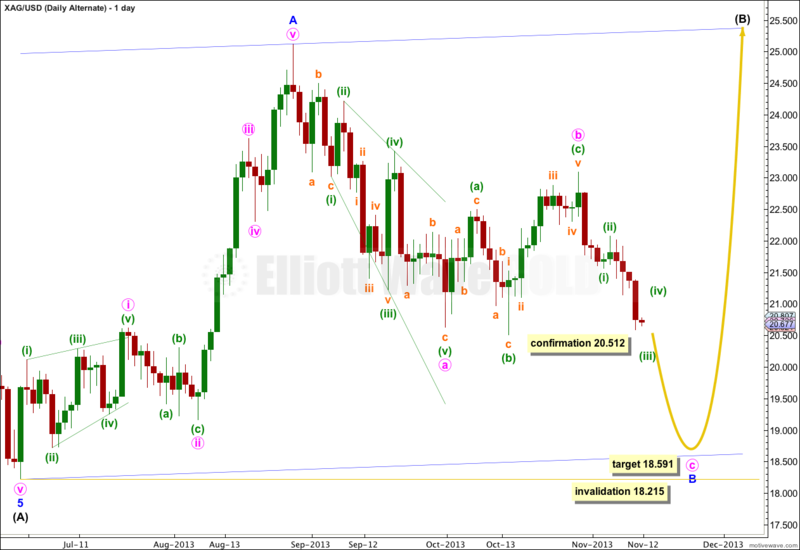 If that happens.. then I would have no current wave count for silver. The main wave count for silver is invalid. 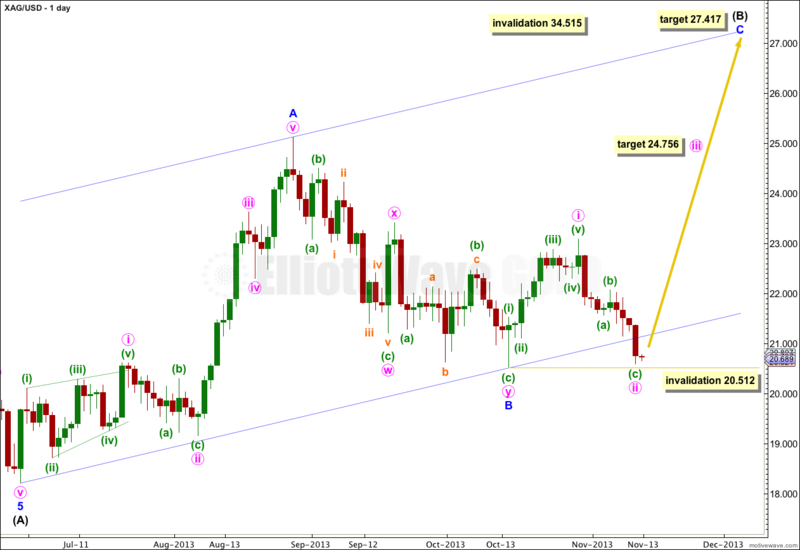 Both wave counts for gold remain valid at this stage, but I still expect that market too to move lower now. gold should have same direction with sliver even though gold is up and silver is down today. exactly. this is why I have switched my gold counts over today; the alternate is now the main preferred count. if I am expecting a fair bit of downwards movement for silver then in the short term I expect gold to follow. 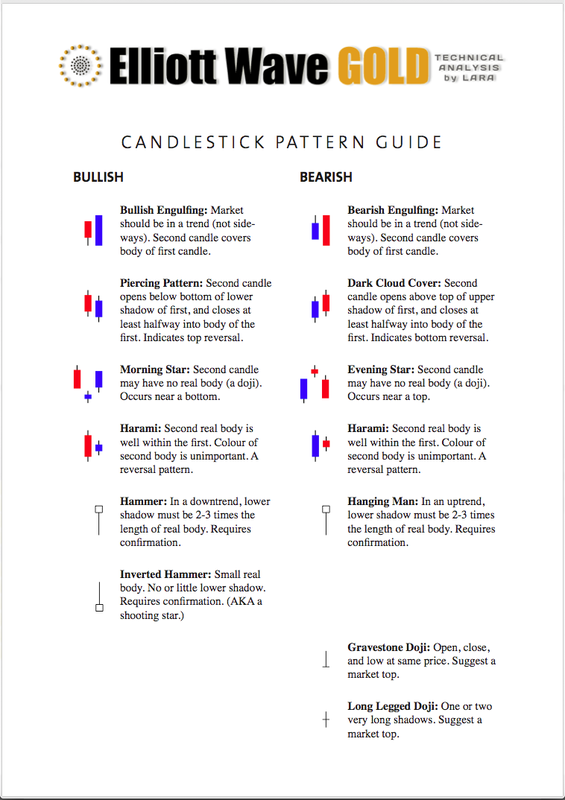 although they don’t always turn on the same date at primary and cycle degree, they do usually turn on the same date at minor and intermediate degree on the daily chart. XAG touched $20.4 on this morning, that means alternate count will be available, is it right? That is correct. The main wave count is invalidated and the alternate is correct.